Background: A history of past exacerbations is a predictor of future events for patients with chronic obstructive pulmonary disease (COPD). Very little is known about the effect of pharmacologic therapies on patients with frequent or infrequent exacerbations. Methods: We conducted a post-hoc analysis of the Understanding Potential Long-term Impacts on Function with Tiotropium (UPLIFT®­) trial database. Patients were classified as having a low risk of exacerbations if they experienced ≤1 exacerbation and no COPD-related hospitalization(s) in the year preceding trial entry or as high risk of exacerbations if they had ≥2 exacerbations (courses of oral steroids/antibiotics) or ≥1 COPD-related hospitalization(s) in the year preceding the trial. Conclusions: This analysis shows that tiotropium reduces the risk of subsequent exacerbation and also prolongs time to first exacerbation, in both the high- and low-risk exacerbator subgroups. It also decreases the proportion of patients who shift from the low- to the high-risk exacerbations group compared to placebo. Citation: Celli BR, Decramer M, Asijee GM, Kupas K, Tashkin DP. Effects of tiotropium on exacerbations in patients with COPD with low or high risk of exacerbations: A post-hoc analysis from the 4-year UPLIFT® trial. Funding Support: This study was supported by Boehringer Ingelheim and Pfizer. Significant efforts have been made, not only in detecting and characterizing exacerbations, but also in preventing their occurrence and managing recurrence. The Latin American Project for Research in Pulmonary Obstruction (PLATINO) population study7 and the Evaluation of COPDLongitudinally to Identify Predictive Surrogate Endpoints (ECLIPSE) observational study of patients with COPD8 suggested that patients suffering from frequent exacerbations belong to a distinct phenotype and that a history of past exacerbations is a predictor of future events for patients suffering from this disease. Results from these studies indicate that patients at risk for exacerbations could be classified into frequent (≥2) or infrequent (<2) exacerbators based on the number of exacerbations experienced per year. Based on these observations, the recently updated Global initiative for chronic Obstructive Lung Disease (GOLD) 2014 guidelines divide patients into low risk (≤1 non-severe exacerbations and no severe exacerbations) and high-risk (≥2 non-severe exacerbations or ≥1 severe exacerbation) categories.9 The difference between the 2 definitions therefore, is that 1 hospitalization (severe exacerbation), according to the ECLIPSE definition, would suggest an infrequent exacerbator, whereas according to the new GOLD definition this would suggest a high risk exacerbator. Finally, it has been reported that up to 50% of exacerbations are not reported1 and, therefore, it is likely that the number of reported exacerbations under-represent the true magnitude of the problem. It follows that it would be desirable not only to prevent frequent exacerbations from recurring, but also to prevent exacerbations from occurring at all, including those reported by infrequent exacerbators. To date, there have been very few studies assessing the potential benefit of pharmacotherapy in frequent and infrequent exacerbators, examined separately. The Understanding Potential Long-term Impacts on Function with Tiotropium (UPLIFT®) trial was a 4-year, randomized, double-blind, placebo-controlled, parallel-group trial involving 5993 patients with moderate to very severe COPD that compared the long-term effects of treatment with the long-acting anticholinergic, tiotropium (18 μg via the HandiHaler® device once daily), versus a matching dose of placebo.10 In the trial, therapy with tiotropium was associated with improvements in lung function, quality of life, and a reduction in exacerbations over a 4-year period, but did not significantly reduce the rate of decline in forced expiratory volume in 1 second (FEV1) versus placebo.10 At the time of entry into the UPLIFT® trial, a detailed questionnaire about the history of exacerbations prior to enrollment was obtained, and the time, number, and severity of the episodes were carefully recorded. In this post-hoc analysis of the UPLIFT® trial database, we investigated the effect of tiotropium on COPD exacerbations in patients considered to be at a low or high risk for exacerbations. UPLIFT® (NCT00144339) was a 4-year, randomized, double-blind, placebo-controlled, parallel-group trial of tiotropium HandiHaler® 18 μg or placebo once daily, involving patients with moderate to very severe COPD who were allowed to use concurrent respiratory therapy with the exception of other inhaled anticholinergics.11 Co-primary endpoints were annual rate of decline in the mean FEV1 measured before and after bronchodilation. Secondary endpoints included exacerbations of COPD and related hospitalizations, and the rate of death from any cause and from lower respiratory conditions. Exacerbations were defined as an increase in or the new onset of more than 1 respiratory symptom (cough, sputum, sputum purulence, wheezing, or dyspnea) lasting 3 days or more and requiring treatment with an antibiotic and/or a systemic corticosteroid. Patients were allowed to continue their usual COPD medications except for other inhaled anticholinergic medications. Inclusion criteria were: age ≥40 years; a smoking history ≥10 pack years; a diagnosis of COPD (post-bronchodilator FEV1 ≤70% predicted and FEV1/forced vital capacity ≤70%). Patients were classified into exacerbation risk groups as described earlier, i.e. : low risk (<2 non-severe exacerbations and no severe exacerbations per year) and high-risk (≥2 non-severe exacerbations or ≥1 severe exacerbation per year) (GOLD definition) or frequent (≥2) or infrequent (<2) exacerbators based on the number of exacerbations experienced per year (ECLIPSE definition). A post-hoc analysis of the number and frequency of COPD exacerbations from the UPLIFT® database was conducted. Time-to-event and number-of-event data were analyzed for treated patients throughout the 4-year study treatment duration. Analyses were performed by the subgroups low/high risk as defined at baseline based on collected COPD characteristics, including hospitalization due to an exacerbation and medication use. A Cox proportional hazards regression model was used for time-to-exacerbation analyses. Hazard ratios (HR) and p-values were based on subgroup-restricted Cox regression with treatment as a covariate. Poisson regression correcting for overdispersion and adjusting for treatment exposure and with terms for subgroup and treatment-by-subgroup interaction was used for number-of-event analyses. The probability of being a high-risk patient under treatment was analyzed using a log-binomial model with terms for subgroup and treatment-by-subgroup interaction. An additional post-hoc subgroup analysis comparing patients in each study group who were or were not receiving inhaled corticosteroids (ICS) at baseline was conducted. The baseline characteristics of the patients included in the study are shown in Table 1, stratified according to their exacerbation history. The tiotropium and placebo groups within each risk category were well balanced on age, smoking history, and their postbronchodilation spirometry measurements. Notable differences between the 2 risk groups were seen in their baseline concomitant respiratory medications: the proportion of patients considered to be at a high risk for exacerbations who were using ICS, other steroids, long acting β2-agonists (LABAs) and ICS + LABA combinations at baseline was numerically greater compared with patients in the low-risk group (Table 1). 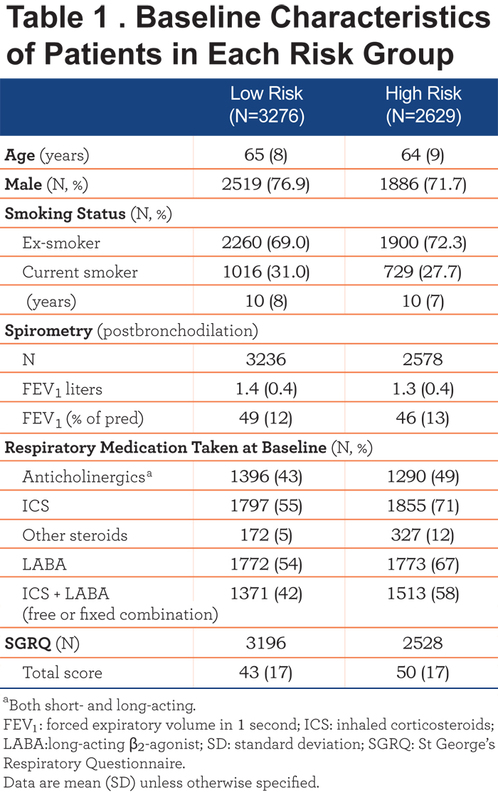 In terms of their health status as assessed using the St. George’s Respiratory Questionnaire (SGRQ), patients in the low-risk group had lower total scores, i.e., clinically-relevant better health-related quality of life compared with those in the high-risk group (Table 1). This difference was also reflected in their respective domain scores (data not shown). 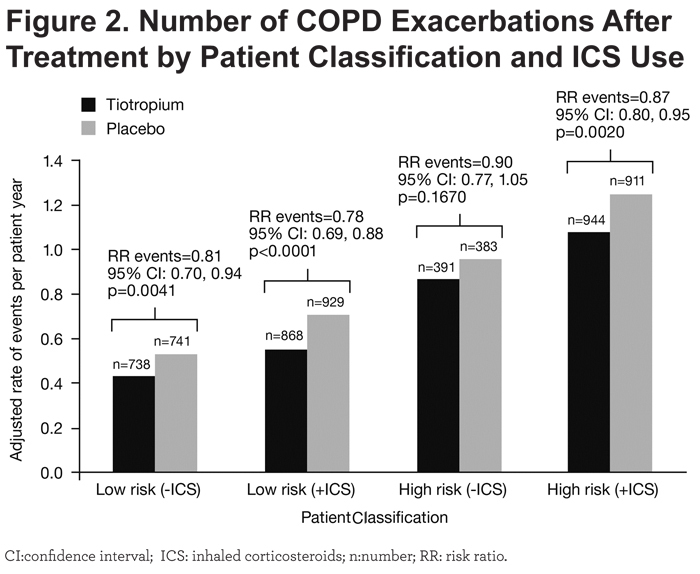 Tiotropium significantly reduced the time to first COPD exacerbation compared to placebo in patients considered to be at low risk (HR: 0.81; 95% confidence interval [CI]: 0.74, 0.88; p<0.0001) and high-risk for exacerbations (HR: 0.89; 95% CI: 0.81, 0.97; p=0.0066) (Table 2). The effect of tiotropium was more pronounced in the low-risk exacerbator group when compared with the high-risk exacerbator group (Table 2). Patients who were or were not receiving ICS at baseline showed comparable results (post-hoc subgroup analysis), although in patients classified as being at high risk for exacerbations and not receiving ICS at baseline, the trend towards tiotropium reducing the number of COPD exacerbations was only numerically maintained (Table 3). 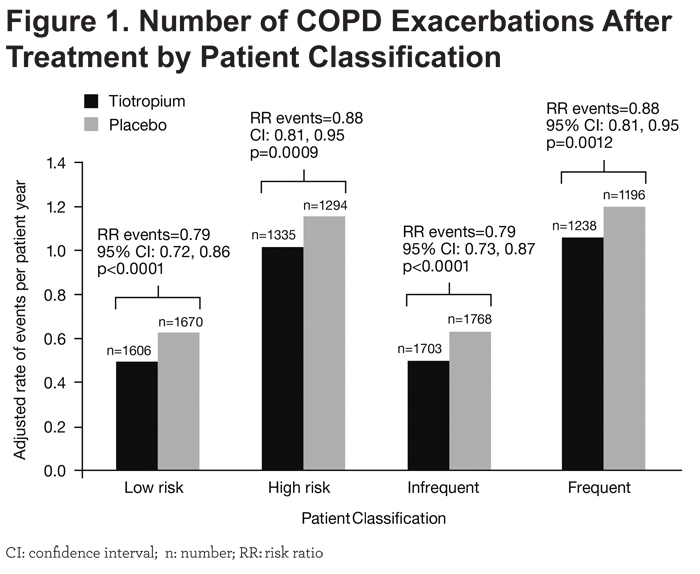 In patients classified as either infrequent exacerbators or frequent exacerbators, tiotropium also significantly reduced the time to first COPD exacerbation compared to placebo (HR: 0.81; 95% CI: 0.74, 0.88; p <0.0001 and HR: 0.90; 95% CI: 0.82, 0.99; p=0.0230) respectively. (Table 2). Tiotropium significantly reduced the number of COPD exacerbations compared to placebo in patients considered to be at low risk for exacerbations (rate ratio [RR]: 0.79; 95% CI: 0.72, 0.86; p<0.0001) as well as in those considered to be at high risk for exacerbations (RR: 0.88; 95% CI: 0.81; 0.95; p=0.0009) (Figure 1). Patients who were or were not receiving ICS at baseline showed comparable results (post-hoc subgroup analysis), although for patients classified as being at high risk for exacerbations and not receiving ICS at baseline, tiotropium reduced the number of COPD exacerbations only numerically (Figure 2). The effect of tiotropium for both infrequent and frequent exacerbator phenotypes was similar to that observed in the low- and high-risk exacerbator phenotypes (Figure 1). During the year prior to entry into the UPLIFT® trial, the ratio of infrequent to frequent exacerbators was roughly comparable in both treatment arms. However, 1 year’s treatment with tiotropium resulted in a bigger shift of patients from the high-risk groups to the low-risk groups when compared to placebo, as indicated by a larger increase in this ratio among patients receiving tiotropium (Table 4). After 1 year of treatment, the risk of remaining in the high-risk subgroup was numerically lower in the tiotropium than in the placebo group (RR: 0.94; 95% CI: 0.84, 1.05; p=0.2765). The risk of patients who were low risk in the previous year, becoming high risk after 1 year of treatment, was statistically lower in the tiotropium group compared to placebo (RR: 0.78; 95% CI: 0.67, 0.92; p=0.0030) (Table 5). Similar results were observed when using the ECLIPSE definition (Tables 4 and 5). This post-hoc analysis of data from the UPLIFT® trial investigated the effect of treatment with tiotropium on exacerbations compared with placebo in different patient phenotypes i.e., those defined as infrequent or frequent exacerbators (ECLIPSE definition), as well as in patients with different risks for exacerbations (low risk/high risk GOLD 2014 definition). This analyses had 2 novel findings. First, pharmacologic therapy with tiotropium, compared to placebo, reduced the frequency of exacerbations and prolonged the time-to-first exacerbation in patients with COPD in both the high-risk (frequent) and low-risk (infrequent) exacerbator patient subgroups, with larger effects exhibited in the low-risk (infrequent) exacerbator subgroup. This analysis was not influenced by use or lack of use of ICS at baseline. Second, treatment with tiotropium resulted in a favorable shift in the ratio for low-risk (infrequent)/high-risk (frequent) for COPD exacerbations and a statistically lower risk for a low-risk (infrequent) exacerbator becoming a high-risk (frequent) exacerbator. All guidelines agree that prevention of exacerbations is a high priority item in the management of patients with COPD.9,12 It has been shown that the number of exacerbations per year constitutes a risk factor for worse outcome wherein frequent exacerbators manifest worse health status, worse lung function, and a greater risk of hospitalizations.8 Thus, even though the ultimate goal remains to prevent exacerbations from happening at all, it is likely that those patients who are frequent exacerbators could benefit from therapies aimed at decreasing the frequency of exacerbations if not abolishing them altogether. The first observation from this analysis of the UPLIFT® data shows that treatment with tiotropium was effective in decreasing the number of exacerbations in the subsequent years, as well as the time to first exacerbations—not only in the frequent but also in the infrequent exacerbator phenotype. Importantly, the effect appeared larger in the patients with a low exacerbation frequency reported at baseline. This may be of prognostic significance, as data reported from analysis of a large health care database suggest that exacerbations begin as rare events and their frequency increases with progressive episodes.5 If we can decrease the exacerbation rate and time to first exacerbation in patients with a low rate of exacerbations, it seems likely that the subsequent course of disease may be slowed, a hypothesis that may need prospective testing but is unlikely to be addressed as studies lasting longer than the 4-year duration of UPLIFT® are difficult to complete. Decline in lung function (FEV1 over time) is greater in GOLD Stage II as compared with GOLD Stages III and IV. The ECLIPSE study8 showed that there were less frequent exacerbators present in GOLD Stage II than GOLD Stages III and IV. This could potentially explain a larger effect of tiotropium in the infrequent/low-risk group.It is important to note that the effect observed from treatment with tiotropium on COPD exacerbations did not appear to be influenced by the concomitant use of ICS, providing clinicians with the capacity to adjust therapy as they deem appropriate. Possibly also in the frequent/high-risk exacerbator phenotype patient, the worse health status, dyspnea and lung function mean that there is less capacity for improvement with tiotropium, thus explaining the smaller, perhaps less modifiable, effect observed in these patients compared with infrequent/low-risk exacerbator phenotype patients. The second finding of the study was that regardless of the definition applied (ECLIPSE or GOLD), treatment with tiotropium resulted in a higher proportion of patients shifting from the high-risk/frequent to the low-risk/infrequent exacerbator group. Further, compared to placebo, 1-year of treatment with tiotropium prevented a larger proportion of patients who were initially in the low-risk/infrequent exacerbator group at baseline from transitioning to the high-risk/frequent exacerbator group. This is an important finding since the frequency of exacerbations appears to be an important determinant of future adverse outcomes.5,6 Although many studies using different pharmacologic agents have shown benefits in reducing exacerbations or prolonging time to first exacerbation,13-19 there have been very few attempts to relate therapy to change in future risk classification.20 The results of this analysis show that tiotropium not only improves the ratio of low- to high-risk classification, but also prevents a larger proportion of patients from progressing from the low- to the high-risk grade. We recognize that this study had several limitations. First, this was a post-hoc analysis of data from a trial not designed specifically to test the effect of tiotropium in different exacerbator phenotypes. However, the detailed information regarding exacerbation history before enrollment and subsequently recorded over the course of the study, the large number of patients that participated, and the careful attention to study outcomes provides confidence in the results. Second, there was inconsistency in the level of detail provided regarding patient hospitalizations in the year prior to enrollment, an outcome that is certainly important. This remains a problem in multi-center international studies where the differences in resources and patterns of health care services limit the capacity to adequately interpret observed results. In summary, detailed analysis of data from the UPLIFT® study shows that pharmacologic treatment with tiotropium prolongs the time to first exacerbation and decreases the number of subsequent exacerbations not only in patients at high risk (frequent exacerbators) but also in those at low risk (infrequent exacerbators), independent of ICS therapy. Additionally, tiotropium is associated with a larger proportion of patients shifting from the high-risk/frequent exacerbator group to the low-risk/infrequent exacerbator group. Tiotropium also prevents the progression of patients from the low- to the high-risk exacerbator group. The authors acknowledge the medical writing and editorial assistance from Godfrey Lisk, PhD, Scientific Specialist at PAREXEL International, in the form of generation of figures and tables, preparation and revision of the draft manuscript. All authors were responsible for the planning and interpretation of the data. Professor Celli was the primary person responsible for the writing of the manuscript. Bartolome R Celli, MD, has received research grants to his academic division from AstraZeneca, advisory board or consultancy payments from GlaxoSmithKline, Boehringer Ingelheim, Almirall, AstraZeneca, Takeda, and Novartis. Neither he nor any family members have shares or commercial interests in any company. He has not received payments or had any relationship with the tobacco industry. Donald P Tashkin, MD, has received research grants to his university from Boehringer Ingelheim, AstraZeneca, Novartis, Sunovion, and GlaxoSmithKline, consultancy payments from AstraZeneca, Novartis, Sunovion, and Theravance, and speaker fees from Boehringer Ingelheim, AstraZeneca, Sunovion, and Forest. Neither he nor a member of his family has shares in any company or any relationship with the tobacco industry.Marc Decramer, MD, has received speaker fees from AstraZeneca, GlaxoSmithKline, Boehringer Ingelheim, Pfizer, and Novartis, consulting fees from AstraZeneca, Boehringer Ingelheim, Pfizer, Dompe, GlaxoSmithKline, Novartis, Nycomed, and Vectura, and grant support of AstraZeneca, Boehringer Ingelheim, Pfizer, GlaxoSmithKline, and Chiesi. Guus M. Asijee, PhD, is an employee of Boehringer Ingelheim. Katrin Kupas, PhD, is an independent statistician, hired by Boehringer Ingelheim.